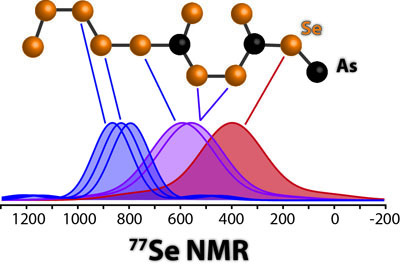 Five homogeneous arsenic selenide glasses with target compositions As2Se3, AsSe2, AsSe3, AsSe4.5 and AsSe6 were studied quantitatively by 77Se CPMG-MAS-NMR and TEM-EDX. The whole set of NMR spectra is simultaneously fitted with six distinct environments taking into account the effect of first and second neighbors on the position of the 77Se resonance. The selenium chains are bound at each end to trivalent arsenic atoms, and the chain lengths distribution can be modeled with the Flory theory, which is well known in polymer science, and is used here for the first time to model the probability to find each selenium environments in a selenide glass. No arsenic homopolar bond is detected in our experiments.